The Vertex Laser Geo and the Laser Geo – new instrument models that offer tested and proven reliable high precision measuring capacity and include built-in GPS and compass with special features for all types of measuring and mapping work. The new instrument models are programmable and can be custom adapted. 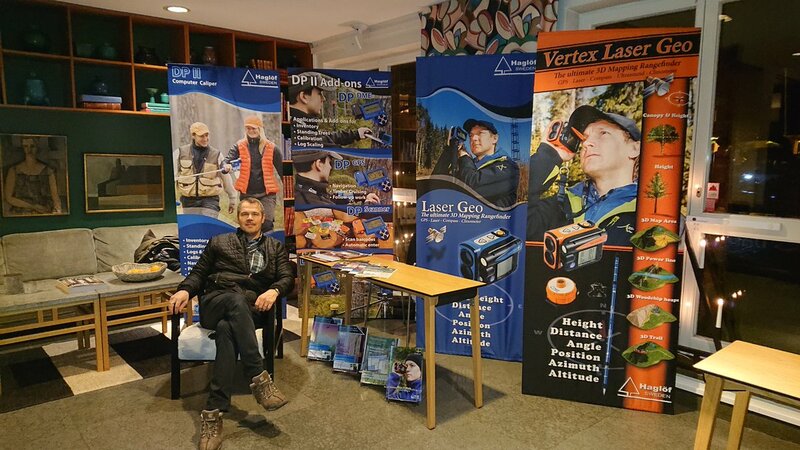 Read more on The Vertex Laser Geo - All you need in a Rangefinder-Hypsometer!. The TrailBlazer® - a simple but efficient solution to find border and boundaries in the forest. Built in green laser pointer with high visibility and fits with standard compass brands. The TrailBlazer is adapted for 2-person use, where one person wears a reflective vest designed to enhance visibility on the field for the laser pointer. Read more on the The TrailBlazer® storecialis.net. EC II D – If you have tried Haglöf digital clinometers, you already know about the easy use and accurate results you get. The new implemented distance calculation function will make your life in the forest even easier – just mark a reference height on the tree, aim and get the ready height result in the instrument display. The distance calculation function is also available in our EC II R-D instrument! Read more on EC II-D.
Slope Corrector: A new instrument system to measure horizontal distances in steep terrain. The system is built for use with the DP II caliper and a custom programmed DP DME add-on module, with caliper software application and a unique transponder system - work with Haglöf Sweden’s proven reliable ultrasound technology method to get distance reading from steep heights or slopes. Read more on the Slope Corrector System here.